This spider is can be a greenish to yellowish and reddish in colour. It preys on large insects, small mammals and reptiles. The name itself doesn’t reflect on the colour of the spider but rather the colour of the web that they spin. The venom of the Golden Silk Orb-Weaver Spider is poisonous but not lethal to humans. 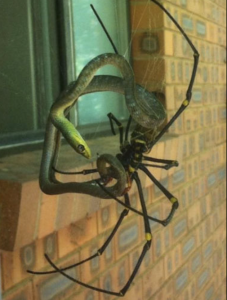 the poison of a Golden Silk Orb-Weaver Spider has a neurotoxic effect similar to that of the Black Widow Spider.